The other day I ordered a copy of Marguerite Patten's 'Cookery in Colour'. Every generation of my family has one of these and it is filled with recipes that range from the wondrous Roman sandwich boat to the frankly disgusting anchovy stuffed eggs. For me and my family, it is the first stop for any culinary related questions and when we found some sour milk at the back of the fridge, I knew exactly where to look. 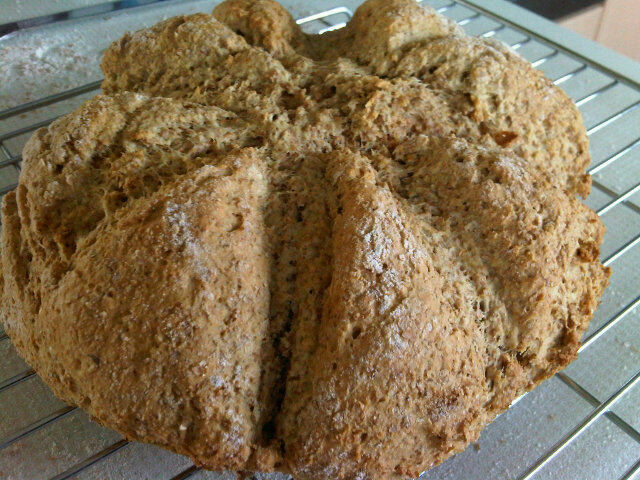 This recipe may put some people off as it uses sour milk but I can promise that you cannot taste it once the bread has been cooked. Dissolve the bicarbonate of soda into the sour milk and add to the flour along with the salt. This does look pretty vile but I promise it ends up tasting divine! Knead lightly and form into a round loaf. Using a knife, lightly score across the loaf to make it easier to divide up when cooked. Place on a baking sheet and bake in the centre of a hot oven 240°C/ 475°F / Gas Mark 8 for 15 minutes then lower the heat to 190°C/ 375°F/ Gas Mark 5 and bake for a further 10-15 minutes until golden brown. Enjoy hot out of the oven with butter and jam! I love recipes like this that are so easy to do but also use up ingredients that otherwise would have been thrown away. Do you have a 'cooking bible'? What's your favourite thrifty recipe? the sour milk doesn't even put me off, this looks lush! oooo im gonna have to try this! i love making fresh bread it tastes lush and fills my house with a lovely aroma! mmm I'de love a nice warm slice of that with butter on! Mary Berry is godess of baking books. Oh yes. I worship at her feet. I might cheat on her to make this. Mmm this looks delicious! It's been ages since I've baked anything, this is making me want to spend all afternoon in the kitchen now! oh yum, this looks delicious! my favourite receipes are from Womens Weekly cook books they are really easy.